Like most other sports, table tennis had humble beginnings as a “parlor game,” open to anyone with access to a table, paddle, and ball. The game began in the 1880s, when lawn tennis players adapted their game to play indoors during the winter. 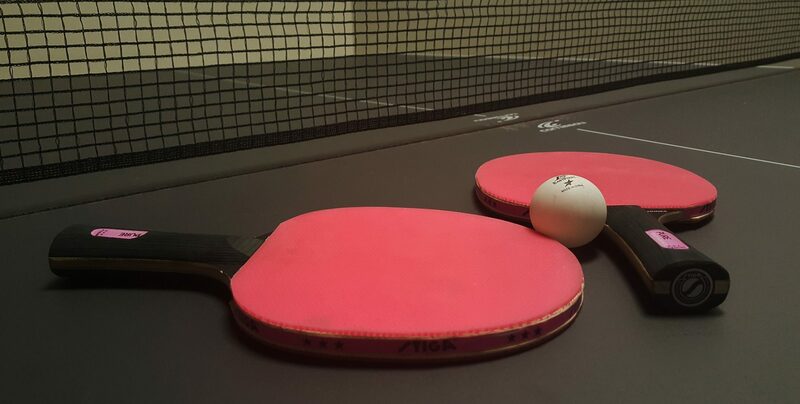 Ping-Pong is a trademark name for table tennis and associated equipment. The name “Ping-Pong” was invented by the English firm J. Jaques and Son at the end of the 1800s and later trademarked in the United States by Parker Brothers, the board game company. The game quickly caught on, and as early as 1901, tournaments were being conducted with over 300 participants. The Ping-Pong Association was formed but was renamed The Table Tennis Association in 1922. In 1902 a visiting Japanese university professor took the game back to Japan, where he introduced it to university students. Shortly after, a British salesman, Edward Shires, introduced it to the people of Vienna and Budapest, and the seeds were sown for a sport that now enjoys popularity all over the world. In Britain, table tennis had also begun to spread outside the distinctly middle-class confines of London, and leagues sprang up in provincial towns as far apart as Sunderland and Plymouth. In 1922, an All England Club was formed, which boasted such luminaries as Jack Hobbs the cricketer and other famous names of the time from the world of sport. The Daily Mirror organized and sponsored a nationwide tournament in which there were 40,000 competitors. Table tennis was firmly on the map, and on April 24, 1927, the English Table Tennis Association was born, under the chairmanship and direction of Ivor Montague, son of Lord Ewatthling. He was not only to become the architect of modern-day table tennis, but he also achieved critical acclaim as both a director and film producer. At the time, The ETTA had a membership of 19 leagues but now has over 300, with around 75,000 registered players. The first world championships were held in 1927 and were won by a Hungarian, Dr. Jacobi. Apart from the famous Fred Perry redressing the balance for England in 1929, this was to be the start of an unprecedented run of success for the Hungarians, who completely dominated the game throughout the thirties. Their team was led by the legendary Victor Barna, whose inspiration and skill did so much to elevate the game to sports status. The 1950s saw the game turned upside down by the invention of the sponge or sandwich rubber, this new material for bats, which, up until now, had been a relatively simple affair with a universal thin covering of pimpled rubber. Until this time, spin had played only a minor part in a game that had been dominated by the defensive style of play. But these new bats or paddles, introduced by the Japanese, had the capacity to move the ball around in an almost magical way. The ITTF, the game’s governing body, was quick to legislate in a bid to control this new development, seen in some quarters as equipping players with an unfair advantage. The thickness of the sponge and rubber sandwich was controlled and remains so to this day. But the nature of the game had been changed, establishing the fast attacking speed and spin style of the modern game. Today, the sport both in England and abroad is very well established and is growing each year. The culmination of this has been its recognition as an Olympic Games sport, being featured for the first time in the 1988 games in Seoul. Television coverage of the men’s singles final attracted an incredible worldwide audience of 2 billion. In China, the game is played by literally millions at work, in school, and in community parks. Chinese top players are regarded as national heroes with pop star statuses.